Valentine’s Day is a day of love when you express your love to someone special in your life, cherish the moment and make future plans to cherish your long term relationship. Unfortunately, for many this day can also turn out to be when couples break up. JumpTrends – Research and Demographic from Jumpdates did a research on what impact these break ups have on traffic trends on free online dating sites, Jumpdates.com. JumpTrends found that online singles start looking for their Valentine’s Day on free online dating sites from the 1st of February as the visits to the Jumpdates.com has gone up by as much as 15% for the first week and then continues to be the same in the 2nd week of February 2012. The traffic on free online dating sites were at its normal flow during 12th Feb. to 15th Feb. 2012 which shows that singles were enjoying their time with their dating partner. 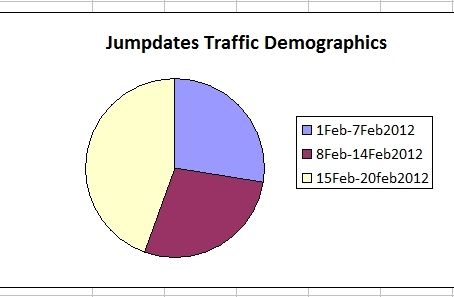 And very near to the dates on 14th Feb 2012, traffic flows were slightly below average. Traffic flow touched its new height as it went up by 18% after 16th Feb 2012 which indicates that young singles faced break ups and were searching for dating partners on free online dating sites. This continues for the entire week following Valentine’s Day. These stats certainly show that online singles start getting ready long before the Valentine’s Day and don’t get bogged down even after facing breakup and start looking all over again for their dating partners in free online dating sites.